Why does Kirsten coach gymnastics? It’s pretty simple, Gymnastics is her thing! Like many, Kirsten started coaching whilst training and attending school full time. After retiring from a long and successful career as an Artistic Gymnast where she reached Level 10, Kirsten went into full time coaching of her chosen disciplines of Gymnastics WAG, MAG and Kindergym. But WAG was where her passion resided. Kirsten loves the challenges both coach and gymnast get to experience together. The learning of new skills and seeing the excitement on ones face when that skill is achieved. She loves the chance to allow a gymnast to push past their boundaries, because most of the time they under estimate their own abilities. So with a little bit of magic (and a touch of bribery) those moments are priceless. Kirsten loves the friendships, bonds and memories that are created through Gymnastics that can last a lifetime. She loves the stories she collects from years of coaching and can pass on and bring smiles and laughter to her gymnasts. Kirsten has been fortunate enough to have worked with many wonderful mentors in her personal development and hopes to pass this on to future coaches and gymnasts. 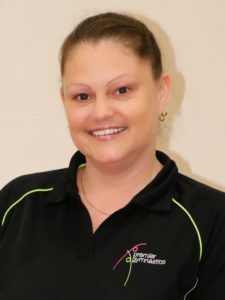 Kirsten is currently one of Queensland’s leading and most successful development Gymnastics Coaches. Kirsten mentors a very successful team of coaches at our Brisbane venue. Below is a list of Kirsten’s qualifications.